Successful vulnerability management (VM) programs aren’t isolated programs. Successful ones include active participants from multiple teams who can share data and results with each other, so that everyone benefits from greater visibility, automation and control. And while in the past VM providers haven’t made their products easy to integrate with, that changes with Tenable.io™. We designed Tenable.io to be the most open VM solution, with multiple ways to integrate it with other products and/or into your workflows and business processes. With Tenable.io, there’s a strong set of pre-built integrations with complementary systems. For example, there are integrations with credential management systems which make it easier for you to access credentials when doing authenticated scans. There are integrations with patch management systems to make it easy to compare vulnerability results. And integrations with mobile device management systems give access to mobile data that would otherwise be very difficult to access. You can learn more about these and other integrations at our Tenable.io integrations page. Even if you’re not currently a customer, you can still take a look at the Tenable.io API today. It’s publicly available and, as you’ll see, is fully documented, simple and testable directly in the browser. 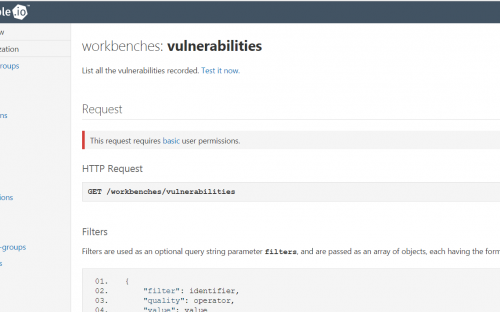 All the capabilities of Tenable.io Vulnerability Management – accurate asset tracking, vulnerability states, workbenches and reports, etc. – are available in the API so that customers and partners can use any data they need in an automated fashion. 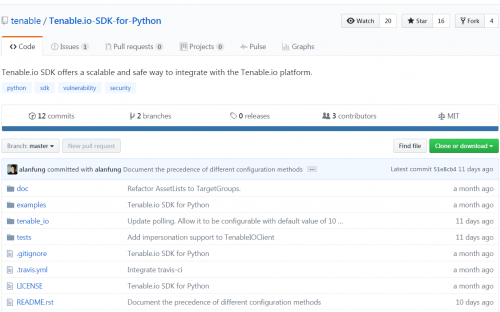 Since not everybody is a programmer, but might still wish to access Tenable.io capabilities and data programmatically, we also created a dedicated SDK, which takes a task-oriented approach to using the Tenable.io API. For example, if you want to run a scan, the scan.launch() function wraps up a variety of API calls into one single line of code. The current Python SDK is available on GitHub. Additional language support will be available in the future and we’ll continue to enhance the SDK as Tenable.io gains more capabilities. Both customers and partners who want to integrate with Tenable.io, but who lack developer resources to do so, will find the SDK invaluable. Integrations make your vulnerability management program more successful, by enabling you to make full use of existing technology investments and by helping to automate manual tasks, so you can focus on the most critical issues. With multiple options available, Tenable.io is easy to integrate into your environment in whatever way makes best sense for your organization.